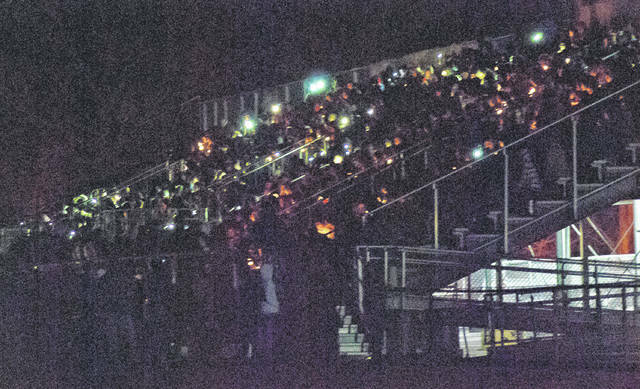 Classmates, family, and friends of Buckeye Valley High School students Jacob Richardson and Mykaela Fellure filled the football bleachers Thursday for a candlelight vigil. After the field lights were lowered, candles and cellphone lights were lit, and a prayer was said. Students came together to mourn the loss of their fellow students who died in a tragic car crash Wednesday afternoon. Buckeye Valley High School students gathered Thursday evening to pay tribute to classmates who perished in a tragic crash. Sophomore Jacob “Jake” Richardson, age 16, and freshman Mykaela Fellure, age 15, were killed in a single-vehicle crash Wednesday afternoon on State Route 257 in Scioto Township. A third student — Alexa Richardson, age 14 — was injured in the crash and received treatment at Nationwide Children’s Hospital in Columbus. She was released on Thursday. Funeral services for Fellure will be held at 4 p.m. Saturday, Jan. 27 at Delaware Christian Church, 2280 W. William St., Delaware. Calling hours will be conducted from 1 p.m. until the time of the service at the church. Funeral services for Richardson will be held at 5:30 p.m. Sunday, Jan. 28 at Grace Church of Powell, 7600 Liberty Road N., Powell. Calling hours will be conducted from 2:30 p.m. to 5 p.m. at the church. Buckeye Valley School Resource Officer Deputy Fred Strawser read a brief statement to the media prior to the student-organized candlelight vigil Thursday evening at the school’s football stadium. Strawser said he’s been the Buckeye Valley school resource officer for six years and that Thursday was a very hard day, but the community has been very supportive. Strawser said that he didn’t have a relationship with either Richardson or Fellure and had not dealt with them much other than saying hello in the hallways in passing. Strawser said everyone grieves differently and that the staff has “extended every measure of comfort.” He said at the beginning of school Thursday morning the mood was one of shock and then moved on to grieving as the day progressed. Strawser said he himself, during this time of grieving, has a few students that he has relationships with who came to talk with him. He said he tries to be a supportive presence and that he lets them grieve in their own way. “I try to give them some words of encouragement and lift them up,” he said. Superintendent Andrew Miller said additional counselors were made available to students on Thursday and Friday and, if needed, will also be available early next week. This entry was tagged Fred Strawser, Jacob Richardson, Mykaela Fellure. Bookmark the permalink.